This class implements the base of a special lattice element following the concepts orginally developed by John Bolander. In this lattice framework, elements consists of rigid bodies connected by a set of axial tranversal and rotational springs at the position of the GP. In the case of an irregular arrangement of lattice elements, the position of the GP is not placed at the midpoint of the element, but the midpoint of the element's midcross-section. There is no way to relate the element geometry to the position of the GP. Instead, this information is part of the input. In this base class common interfaces of derived elements are defined. Definition at line 53 of file latticestructuralelement.h. Definition at line 38 of file latticestructuralelement.C. Definition at line 41 of file latticestructuralelement.C. Usually computes interpolation function, which is not needed for the lattice elements. However, structural element requires implementation. Definition at line 108 of file latticestructuralelement.h. Returns the cross-sectional area of the lattice element. Definition at line 65 of file latticestructuralelement.h. Definition at line 123 of file latticestructuralelement.h. Definition at line 129 of file latticestructuralelement.h. Definition at line 77 of file latticestructuralelement.h. 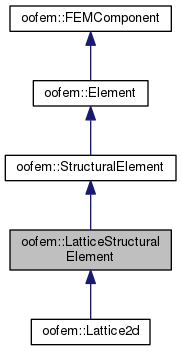 Definition at line 88 of file latticestructuralelement.h. Returns the increment of dissipation computed at the GaussPoint of the element. This function is used for the lattice specific vtk export. Definition at line 116 of file latticestructuralelement.h. Returns the energy dissipation computed at the GaussPoint of the element. Definition at line 101 of file latticestructuralelement.h. Definition at line 153 of file latticestructuralelement.h. Definition at line 71 of file latticestructuralelement.h. Definition at line 135 of file latticestructuralelement.h. Returns the number of crossSection nodes. Definition at line 83 of file latticestructuralelement.h. Definition at line 93 of file latticestructuralelement.h. Returns the old normal stress. Definition at line 141 of file latticestructuralelement.h. Returns flag indicating if status has been updated. Definition at line 147 of file latticestructuralelement.h. This function is called immediately after creating object using constructor. Input record can be imagined as data record in component database belonging to receiver. Receiver may use value-name extracting functions to extract particular field from record. ir Input record to initialize from. Definition at line 45 of file latticestructuralelement.C.